Senior Joey Wardlow led off the game with a home run. His Key West Conchs took it from there, going on to an 11-1 rout for the 1984 section championship. "We've really come on as a team lately," Key West head coach Pedro Fraga told The Palm Beach Post afterward. "I have nine seniors who really wanted to make their last year the best. It's been a long time since we came this far and they're hungry." One of those seniors was Wardlow. Wardlow continued playing beyond high school, into college and the pros. His pro career, though, was brief, just four seasons. He briefly made AA. 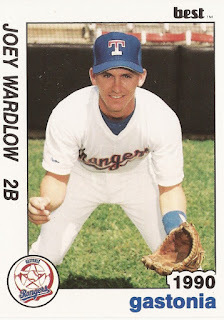 Wardlow's pro career began in 1988, taken by the Rangers in the 20th round of the draft out of the University of Tampa. At Tampa, Wardlow won second team All-America honors in 1988 and first-team All-South Region in 1987 and 1988. In 1986, he made the NCAA South Regional All-Tournament Team. In a February 1987 contest, Wardlow knocked a bases-loaded double, breaking a late tie. In an April 1988 game, he hit a home run in a losing effort. With the Rangers, Wardlow started at rookie Butte. He hit .339 in 62 games there. He helped extend an August Butte lead with a single. Wardlow also helped the Copper Kings to the playoffs, knocking three hits and driving in two runs in a Game 4 championship series win that forced a deciding Game 5. For 1989, Wardlow played at single-A Port Charlotte, getting a brief stint at single-A Gastonia. Between them, he hit .303 in 57 games. He played exclusively at Gastonia in 1990, getting into 122 games and hitting .245. For 1991, Wardlow moved to the Yankees system and high-A Prince William. He hit a two-run single in a June game. He also got a five-game look with AA Albany-Colonie. But it was his final season as a pro.